We're currently hosting the installer whilst we wait for feedback about integrating our code with Rami Ismail's implementation (Github references are at the end of this post). Install the Python 2.7 (required for the tools) and the App Engine SDKs following the instructions here: https://developers.google.com/appengine/docs/php/gettingstarted/installing. Note: you don't need mySQL as presskit() doesn't require it. Note: as stated above we're temporarily hosting the installer on our website. Extract the contents of dopresskit_install.zip to a directory of your choice (we'll call it [..\myPresskitDir]). You should now have 2 files in your [..\myPresskitDir] folder: app.yaml and install.php. Open the Google App Engine Launcher. Select File > Add Existing Application…. Set the Application Path to [..\myPresskitDir] and press Add. An application with the name [my-presskit-app] is listed in the GAE Launcher. Select and Run it. Note: this part is not GAE specific. replace the application name [my-presskit-app] with a unique name you can use for your application. Note: the application identifier should meet certain requirements: only lower-case letters, digits, and - characters are allowed; the application id should not begin with -. For each project (game) folder: copy and paste the images and trailers handlers which have the [game1] folders and change [game1] to your project name. You should now have a locally working version of Presskit(). Note: the 'Request Press Copy' feature won't send emails when running on the local development environment. If you want a site icon add a favicon.ico to your root directory. Upload to Google App Engine. Test your online presskit() page(s) by going to [my-presskit-app].appspot.com. Same as during installation: run the application locally using the GAE launcher, open the page in your browser and make your changes. When ready, delete install.php and upload the files to Google App Engine. Don't use push-to-deploy (= having your git repository hosted at Google/github, automatically deploy whenever the repository gets pushed). Here's the report for this issue for tracking when Google eventually fixes this: GAE issue 10939: application_readable app.yaml directive ignored when using push-to-deploy with PHP. Thanks to Sebastian Mayer (@Sebioff_) for finding the issue! Branch: Master (source code on Github), contains no code related to GAE. fixed the 'Request Press Copy' email: improved feedback on invalid email address entry, error sending message and success sending message. fixed the projects pages title: replaced COMPANY_TITLE with GAME_TITLE. body: someone@examplepresscompany.com of ExamplePressCompany has requested a Press Copy for my2ndGameName through the press kit interface. fixed the projects pages left-handside navigation: replaced "projects" with "features". Added conditional code to detect whether running on GAE or not to index.php, sheet.php and mail.php. As a result, if running on GAE, it'll use the appropriate API for GAE. modified install.php so that at installation, archive.zip is retrieved from our server (https://www.enkisoftware.com/downloads/dopresskit/) instead of Rami's (http://www.ramiismail.com/kit/press/). Note: if/when our code is merged back with the default dopresskit we'll revert this feature and stop hosting the installer dopresskit_install.zip and archive.zip on our server. Thanks to Rami Ismail and Leonard Ritter for making presskit and encouraging us to port it to GAE! presskit() was created by Rami Ismail (@tha_rami) of Dutch independent game studio Vlambeer. All the information about presskit() is available on the dopresskit.com website. Leonard Ritter (@paniq) of independent game studio Duangle did the original port to GAE. You can visit the presskit for Duangle and their game Nowhere. It is already running on GAE. Doug Binks and Juliette Foucaut (writing this post), we continued work on the port, fixed the mailing error handling and other small issues. We modified the installer, tested it and documented the installation process. We're currently hosting the installer on our website. 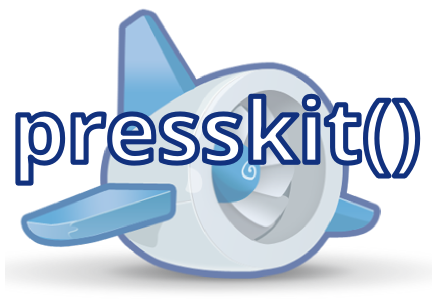 you can find the source code for presskit() on Google App Engine forked on Github (GAE and Master branches). We hope that it will eventually be merged with Rami Ismail's original code, but in the meantime we'll continue to host the installer on our website. Also, feel free to visit press.enkisoftware.com to see the result! If you're curious about why -and how to- host a website on GAE, see this blog post. And finally, if you implement your presskit() on GAE, send me the link and I'll add it to a list of examples.